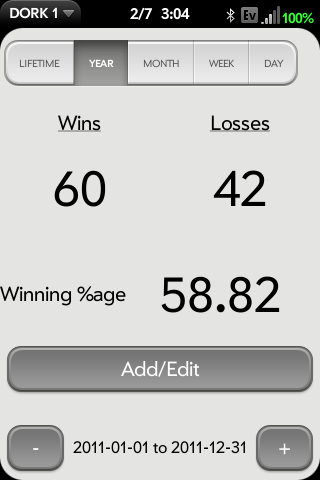 A trivial app which lets you record number of wins/losses each day and will summarize by day/week/month/year/lifetime. I have been using it to keep track of how I do at euchre since we play at lunch almost every day. 1.0.1 - Handle landscape and Pixi. 1.0.2 - Added Help scene.